July 27, 2009 marks the release of the fourth installment from the US Mint in the D.C. and American Territories Quarters, the American Samoa Quarter. This series of quarters is a follow-up to the successful state quarter series that ran for several years before from the mint. American Samoa is a group of five islands and two coral atolls in the South Pacific Ocean, roughly between Hawaii and Australia. These islands are thought to be first inhabited around 1000 BC, but were not reached by European settlers until the eighteenth century. Conflicts between natives and explorers were not uncommon in the first encounters, giving Europeans the impression that the Samoans were ferocious warriors. An interesting incident took place in 1889 when a German naval force invaded a Samoan village and destroyed property, some of which belonged to citizens of the United States. In response, the US sent three warships into the Samoan harbor, but before a conflict could occur, both American and German ships were destroyed by a typhoon. This was just the start of the relationship between Samoa and the United States. The 1899 Tripartite Convention seperated the Samoan archipelago between Germany and the United States, and the US has had a presence there ever since. In World War II, the number of American military personnel outnumbered those of native Samoans. Today, tuna canneries provide employment for a large portion of locals, and no active duty military presence remains, except for the US Coast Guard and an Army Reserve unit. The other quarters available in 2009 as part of this series are the District of Columbia quarter , the Commonwealth of Puerto Rico quarter , the Guam quarter, the U.S. Virgin Islands quarter and the Northern Mariana Islands quarter. All will be minted in quantities to meet demand. Charles Vickers designed the reverse based on recommendations from the American Samoa governor and it's population. It features the ceremonial items of an ava bowl, whisk and staff along with a coconut tree on the shore. 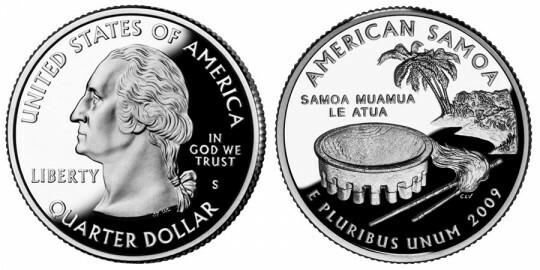 The inscriptions, AMERICAN SAMOA and SAMOA MUAMUA LE ATUA, the motto of American Samoa, which means "Samoa, God is First" are also included.